This article is about the symbol manipulator. For the deciphering machine, see Bombe. For the test of artificial intelligence, see Turing test. For the instrumental rock band, see Turing Machine (band). "Universal machine" redirects here. For the maker of weight-training machines, see Universal Gym Equipment. A Turing machine is an abstract machine that manipulates symbols on a strip of tape according to a table of rules; to be more exact, it is a mathematical model of computation that defines such a device. Despite the model's simplicity, given any computer algorithm, a Turing machine can be constructed that is capable of simulating that algorithm's logic. The machine operates on an infinite memory tape divided into cells. The machine positions its head over a cell and "reads" (scans) the symbol there. Then as per the symbol and its present place in a finite table of user-specified instructions the machine (i) writes a symbol (e.g. a digit or a letter from a finite alphabet) in the cell (some models allowing symbol erasure and/or no writing), then (ii) either moves the tape one cell left or right (some models allow no motion, some models move the head), then (iii) (as determined by the observed symbol and the machine's place in the table) either proceeds to a subsequent instruction or halts the computation. The Turing machine was invented in 1936 by Alan Turing, who called it an a-machine (automatic machine). With this model, Turing was able to answer two questions in the negative: (1) Does a machine exist that can determine whether any arbitrary machine on its tape is "circular" (e.g. freezes, or fails to continue its computational task); similarly, (2) does a machine exist that can determine whether any arbitrary machine on its tape ever prints a given symbol. Thus by providing a mathematical description of a very simple device capable of arbitrary computations, he was able to prove properties of computation in general—and in particular, the uncomputability of the Entscheidungsproblem ("decision problem"). Thus, Turing machines prove fundamental limitations on the power of mechanical computation. While they can express arbitrary computations, their minimalistic design makes them unsuitable for computation in practice: real-world computers are based on different designs that, unlike Turing machines, use random-access memory. Turing completeness is the ability for a system of instructions to simulate a Turing machine. A programming language that is Turing complete is theoretically capable of expressing all tasks accomplishable by computers; nearly all programming languages are Turing complete if the limitations of finite memory are ignored. A Turing machine is a general example of a CPU that controls all data manipulation done by a computer, with the canonical machine using sequential memory to store data. More specifically, it is a machine (automaton) capable of enumerating some arbitrary subset of valid strings of an alphabet; these strings are part of a recursively enumerable set. Assuming a black box, the Turing machine cannot know whether it will eventually enumerate any one specific string of the subset with a given program. This is due to the fact that the halting problem is unsolvable, which has major implications for the theoretical limits of computing. The Turing machine is capable of processing an unrestricted grammar, which further implies that it is capable of robustly evaluating first-order logic in an infinite number of ways. This is famously demonstrated through lambda calculus. A Turing machine that is able to simulate any other Turing machine is called a universal Turing machine (UTM, or simply a universal machine). A more mathematically oriented definition with a similar "universal" nature was introduced by Alonzo Church, whose work on lambda calculus intertwined with Turing's in a formal theory of computation known as the Church–Turing thesis. The thesis states that Turing machines indeed capture the informal notion of effective methods in logic and mathematics, and provide a precise definition of an algorithm or "mechanical procedure". Studying their abstract properties yields many insights into computer science and complexity theory. For visualizations of Turing machines, see Turing machine gallery. The Turing machine mathematically models a machine that mechanically operates on a tape. On this tape are symbols, which the machine can read and write, one at a time, using a tape head. Operation is fully determined by a finite set of elementary instructions such as "in state 42, if the symbol seen is 0, write a 1; if the symbol seen is 1, change into state 17; in state 17, if the symbol seen is 0, write a 1 and change to state 6;" etc. In the original article ("On computable numbers, with an application to the Entscheidungsproblem", see also references below), Turing imagines not a mechanism, but a person whom he calls the "computer", who executes these deterministic mechanical rules slavishly (or as Turing puts it, "in a desultory manner"). Here, the internal state (q1) is shown inside the head, and the illustration describes the tape as being infinite and pre-filled with "0", the symbol serving as blank. The system's full state (its complete configuration) consists of the internal state, any non-blank symbols on the tape (in this illustration "11B"), and the position of the head relative to those symbols including blanks, i.e. "011B". (Drawing after Minsky (1967) p. 121). Assume the same or a new state as prescribed (go to state qi1). In the 4-tuple models, erasing or writing a symbol (aj1) and moving the head left or right (dk) are specified as separate instructions. Specifically, the table tells the machine to (ia) erase or write a symbol or (ib) move the head left or right, and then (ii) assume the same or a new state as prescribed, but not both actions (ia) and (ib) in the same instruction. In some models, if there is no entry in the table for the current combination of symbol and state then the machine will halt; other models require all entries to be filled. Note that every part of the machine (i.e. its state, symbol-collections, and used tape at any given time) and its actions (such as printing, erasing and tape motion) is finite, discrete and distinguishable; it is the unlimited amount of tape and runtime that gives it an unbounded amount of storage space. is a partial function called the transition function, where L is left shift, R is right shift. (A relatively uncommon variant allows "no shift", say N, as a third element of the latter set.) If is not defined on the current state and the current tape symbol, then the machine halts. is the set of final or accepting states. The initial tape contents is said to be accepted by if it eventually halts in a state from . Anything that operates according to these specifications is a Turing machine. Initially all tape cells are marked with . In the words of van Emde Boas (1990), p. 6: "The set-theoretical object [his formal seven-tuple description similar to the above] provides only partial information on how the machine will behave and what its computations will look like." There will need to be many decisions on what the symbols actually look like, and a failproof way of reading and writing symbols indefinitely. The shift left and shift right operations may shift the tape head across the tape, but when actually building a Turing machine it is more practical to make the tape slide back and forth under the head instead. The tape can be finite, and automatically extended with blanks as needed (which is closest to the mathematical definition), but it is more common to think of it as stretching infinitely at both ends and being pre-filled with blanks except on the explicitly given finite fragment the tape head is on. (This is, of course, not implementable in practice.) 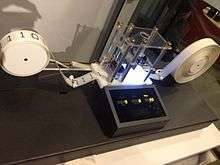 The tape cannot be fixed in length, since that would not correspond to the given definition and would seriously limit the range of computations the machine can perform to those of a linear bounded automaton. Definitions in literature sometimes differ slightly, to make arguments or proofs easier or clearer, but this is always done in such a way that the resulting machine has the same computational power. For example, changing the set to , where N ("None" or "No-operation") would allow the machine to stay on the same tape cell instead of moving left or right, does not increase the machine's computational power. For the remainder of this article "definition 1" (the Turing/Davis convention) will be used. N1 qi Sj Print(Sk) Left L qm (qi, Sj, Sk, L, qm) "blank" = S0, 1=S1, etc. N2 qi Sj Print(Sk) Right R qm (qi, Sj, Sk, R, qm) "blank" = S0, 1=S1, etc. Any Turing table (list of instructions) can be constructed from the above nine 5-tuples. For technical reasons, the three non-printing or "N" instructions (4, 5, 6) can usually be dispensed with. For examples see Turing machine examples. Less frequently the use of 4-tuples are encountered: these represent a further atomization of the Turing instructions (cf Post (1947), Boolos & Jeffrey (1974, 1999), Davis-Sigal-Weyuker (1994)); also see more at Post–Turing machine. Thus the state of progress of the computation at any stage is completely determined by the note of instructions and the symbols on the tape. That is, the state of the system may be described by a single expression (sequence of symbols) consisting of the symbols on the tape followed by Δ (which we suppose not to appear elsewhere) and then by the note of instructions. This expression is called the 'state formula'. Earlier in his paper Turing carried this even further: he gives an example where he placed a symbol of the current "m-configuration"—the instruction's label—beneath the scanned square, together with all the symbols on the tape (Undecidable, p. 121); this he calls "the complete configuration" (Undecidable, p. 118). To print the "complete configuration" on one line, he places the state-label/m-configuration to the left of the scanned symbol. A variant of this is seen in Kleene (1952) where Kleene shows how to write the Gödel number of a machine's "situation": he places the "m-configuration" symbol q4 over the scanned square in roughly the center of the 6 non-blank squares on the tape (see the Turing-tape figure in this article) and puts it to the right of the scanned square. But Kleene refers to "q4" itself as "the machine state" (Kleene, p. 374-375). Hopcroft and Ullman call this composite the "instantaneous description" and follow the Turing convention of putting the "current state" (instruction-label, m-configuration) to the left of the scanned symbol (p. 149). This means: after three moves the tape has ... 000110000 ... on it, the head is scanning the right-most 1, and the state is A. Blanks (in this case represented by "0"s) can be part of the total state as shown here: B01; the tape has a single 1 on it, but the head is scanning the 0 ("blank") to its left and the state is B. "State" in the context of Turing machines should be clarified as to which is being described: (i) the current instruction, or (ii) the list of symbols on the tape together with the current instruction, or (iii) the list of symbols on the tape together with the current instruction placed to the left of the scanned symbol or to the right of the scanned symbol. Turing's biographer Andrew Hodges (1983: 107) has noted and discussed this confusion. The "3-state busy beaver" Turing machine in a finite state representation. Each circle represents a "state" of the TABLE—an "m-configuration" or "instruction". "Direction" of a state transition is shown by an arrow. The label (e.g.. 0/P,R) near the outgoing state (at the "tail" of the arrow) specifies the scanned symbol that causes a particular transition (e.g. 0) followed by a slash /, followed by the subsequent "behaviors" of the machine, e.g. "P Print" then move tape "R Right". No general accepted format exists. The convention shown is after McClusky (1965), Booth (1967), Hill, and Peterson (1974). To the right: the above TABLE as expressed as a "state transition" diagram. Usually large TABLES are better left as tables (Booth, p. 74). They are more readily simulated by computer in tabular form (Booth, p. 74). However, certain concepts—e.g. machines with "reset" states and machines with repeating patterns (cf Hill and Peterson p. 244ff)—can be more readily seen when viewed as a drawing. Whether a drawing represents an improvement on its TABLE must be decided by the reader for the particular context. See Finite state machine for more. The evolution of the busy-beaver's computation starts at the top and proceeds to the bottom. The reader should again be cautioned that such diagrams represent a snapshot of their TABLE frozen in time, not the course ("trajectory") of a computation through time and/or space. While every time the busy beaver machine "runs" it will always follow the same state-trajectory, this is not true for the "copy" machine that can be provided with variable input "parameters". 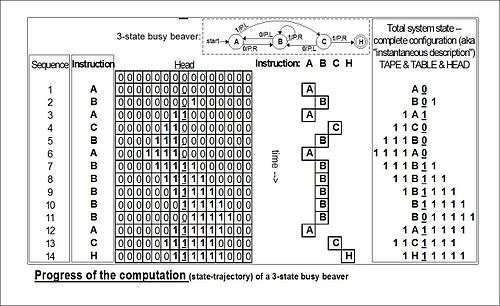 The diagram "Progress of the computation" shows the 3-state busy beaver's "state" (instruction) progress through its computation from start to finish. On the far right is the Turing "complete configuration" (Kleene "situation", Hopcroft–Ullman "instantaneous description") at each step. If the machine were to be stopped and cleared to blank both the "state register" and entire tape, these "configurations" could be used to rekindle a computation anywhere in its progress (cf Turing (1936) Undecidable pp. 139–140). A Turing machine is equivalent to a pushdown automaton that has been made more flexible and concise by relaxing the last-in-first-out requirement of its stack. At the other extreme, some very simple models turn out to be Turing-equivalent, i.e. to have the same computational power as the Turing machine model. 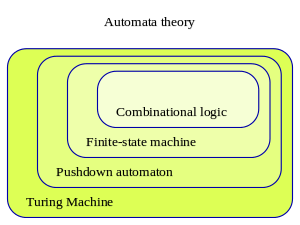 Common equivalent models are the multi-tape Turing machine, multi-track Turing machine, machines with input and output, and the non-deterministic Turing machine (NDTM) as opposed to the deterministic Turing machine (DTM) for which the action table has at most one entry for each combination of symbol and state. Read-only, right-moving Turing machines are equivalent to NDFAs (as well as DFAs by conversion using the NDFA to DFA conversion algorithm). For practical and didactical intentions the equivalent register machine can be used as a usual assembly programming language. ...whose motion is only partially determined by the configuration ... When such a machine reaches one of these ambiguous configurations, it cannot go on until some arbitrary choice has been made by an external operator. This would be the case if we were using machines to deal with axiomatic systems. This is indeed the technique by which a deterministic (i.e. a-) Turing machine can be used to mimic the action of a nondeterministic Turing machine; Turing solved the matter in a footnote and appears to dismiss it from further consideration. An oracle machine or o-machine is a Turing a-machine that pauses its computation at state "o" while, to complete its calculation, it "awaits the decision" of "the oracle"—an unspecified entity "apart from saying that it cannot be a machine" (Turing (1939), Undecidable p. 166–168). The concept is now actively used by mathematicians. This finding is now taken for granted, but at the time (1936) it was considered astonishing. The model of computation that Turing called his "universal machine"—"U" for short—is considered by some (cf Davis (2000)) to have been the fundamental theoretical breakthrough that led to the notion of the stored-program computer. It is often said that Turing machines, unlike simpler automata, are as powerful as real machines, and are able to execute any operation that a real program can. What is neglected in this statement is that, because a real machine can only have a finite number of configurations, this "real machine" is really nothing but a linear bounded automaton. On the other hand, Turing machines are equivalent to machines that have an unlimited amount of storage space for their computations. However, Turing machines are not intended to model computers, but rather they are intended to model computation itself. Historically, computers, which compute only on their (fixed) internal storage, were developed only later. Anything a real computer can compute, a Turing machine can also compute. For example: "A Turing machine can simulate any type of subroutine found in programming languages, including recursive procedures and any of the known parameter-passing mechanisms" (Hopcroft and Ullman p. 157). A large enough FSA can also model any real computer, disregarding IO. Thus, a statement about the limitations of Turing machines will also apply to real computers. The difference lies only with the ability of a Turing machine to manipulate an unbounded amount of data. However, given a finite amount of time, a Turing machine (like a real machine) can only manipulate a finite amount of data. Like a Turing machine, a real machine can have its storage space enlarged as needed, by acquiring more disks or other storage media. If the supply of these runs short, the Turing machine may become less useful as a model. But the fact is that neither Turing machines nor real machines need astronomical amounts of storage space in order to perform useful computation. The processing time required is usually much more of a problem. Descriptions of real machine programs using simpler abstract models are often much more complex than descriptions using Turing machines. For example, a Turing machine describing an algorithm may have a few hundred states, while the equivalent deterministic finite automaton (DFA) on a given real machine has quadrillions. This makes the DFA representation infeasible to analyze. Turing machines describe algorithms independent of how much memory they use. There is a limit to the memory possessed by any current machine, but this limit can rise arbitrarily in time. Turing machines allow us to make statements about algorithms which will (theoretically) hold forever, regardless of advances in conventional computing machine architecture. Turing machines simplify the statement of algorithms. Algorithms running on Turing-equivalent abstract machines are usually more general than their counterparts running on real machines, because they have arbitrary-precision data types available and never have to deal with unexpected conditions (including, but not limited to, running out of memory). One way in which Turing machines are a poor model for programs is that many real programs, such as operating systems and word processors, are written to receive unbounded input over time, and therefore do not halt. Turing machines do not model such ongoing computation well (but can still model portions of it, such as individual procedures). A limitation of Turing machines is that they do not model the strengths of a particular arrangement well. For instance, modern stored-program computers are actually instances of a more specific form of abstract machine known as the random access stored program machine or RASP machine model. Like the Universal Turing machine the RASP stores its "program" in "memory" external to its finite-state machine's "instructions". Unlike the universal Turing machine, the RASP has an infinite number of distinguishable, numbered but unbounded "registers"—memory "cells" that can contain any integer (cf. Elgot and Robinson (1964), Hartmanis (1971), and in particular Cook-Rechow (1973); references at random access machine). The RASP's finite-state machine is equipped with the capability for indirect addressing (e.g. the contents of one register can be used as an address to specify another register); thus the RASP's "program" can address any register in the register-sequence. The upshot of this distinction is that there are computational optimizations that can be performed based on the memory indices, which are not possible in a general Turing machine; thus when Turing machines are used as the basis for bounding running times, a 'false lower bound' can be proven on certain algorithms' running times (due to the false simplifying assumption of a Turing machine). An example of this is binary search, an algorithm that can be shown to perform more quickly when using the RASP model of computation rather than the Turing machine model. They were described in 1936 by Alan Turing. That the whole of development and operations of analysis are now capable of being executed by machinery. Conditional transfer (i.e. conditional "goto"). 10. Determination of the solvability of a Diophantine equation. Given a Diophantine equation with any number of unknown quantities and with rational integral coefficients: To devise a process according to which it can be determined in a finite number of operations whether the equation is solvable in rational integers. The Entscheidungsproblem [decision problem for first-order logic] is solved when we know a procedure that allows for any given logical expression to decide by finitely many operations its validity or satisfiability ... The Entscheidungsproblem must be considered the main problem of mathematical logic. Behmann remarks that ... the general problem is equivalent to the problem of deciding which mathematical propositions are true. If one were able to solve the Entscheidungsproblem then one would have a "procedure for solving many (or even all) mathematical problems". By the 1928 international congress of mathematicians, Hilbert "made his questions quite precise. First, was mathematics complete ... Second, was mathematics consistent ... And thirdly, was mathematics decidable?" (Hodges p. 91, Hawking p. 1121). The first two questions were answered in 1930 by Kurt Gödel at the very same meeting where Hilbert delivered his retirement speech (much to the chagrin of Hilbert); the third—the Entscheidungsproblem—had to wait until the mid-1930s. The problem was that an answer first required a precise definition of "definite general applicable prescription", which Princeton professor Alonzo Church would come to call "effective calculability", and in 1928 no such definition existed. But over the next 6–7 years Emil Post developed his definition of a worker moving from room to room writing and erasing marks per a list of instructions (Post 1936), as did Church and his two students Stephen Kleene and J. B. Rosser by use of Church's lambda-calculus and Gödel's recursion theory (1934). Church's paper (published 15 April 1936) showed that the Entscheidungsproblem was indeed "undecidable" and beat Turing to the punch by almost a year (Turing's paper submitted 28 May 1936, published January 1937). In the meantime, Emil Post submitted a brief paper in the fall of 1936, so Turing at least had priority over Post. While Church refereed Turing's paper, Turing had time to study Church's paper and add an Appendix where he sketched a proof that Church's lambda-calculus and his machines would compute the same functions. But what Church had done was something rather different, and in a certain sense weaker. ... the Turing construction was more direct, and provided an argument from first principles, closing the gap in Church's demonstration. And Post had only proposed a definition of calculability and criticized Church's "definition", but had proved nothing. To the question 'what is a "mechanical" process?' Turing returned the characteristic answer 'Something that can be done by a machine' and he embarked on the highly congenial task of analysing the general notion of a computing machine. I suppose, but do not know, that Turing, right from the start of his work, had as his goal a proof of the undecidability of the Entscheidungsproblem. He told me that the 'main idea' of the paper came to him when he was lying in Grantchester meadows in the summer of 1935. The 'main idea' might have either been his analysis of computation or his realization that there was a universal machine, and so a diagonal argument to prove unsolvability. It was stated above that 'a function is effectively calculable if its values can be found by some purely mechanical process'. We may take this statement literally, understanding by a purely mechanical process one which could be carried out by a machine. It is possible to give a mathematical description, in a certain normal form, of the structures of these machines. The development of these ideas leads to the author's definition of a computable function, and to an identification of computability with effective calculability. It is not difficult, though somewhat laborious, to prove that these three definitions [the 3rd is the λ-calculus] are equivalent. [that] the Hilbert Entscheidungsproblem can have no solution ... I propose, therefore to show that there can be no general process for determining whether a given formula U of the functional calculus K is provable, i.e. that there can be no machine which, supplied with any one U of these formulae, will eventually say whether U is provable. Turing's example (his second proof): If one is to ask for a general procedure to tell us: "Does this machine ever print 0", the question is "undecidable". 1937–1970: The "digital computer", the birth of "computer science"
In 1937, while at Princeton working on his PhD thesis, Turing built a digital (Boolean-logic) multiplier from scratch, making his own electromechanical relays (Hodges p. 138). "Alan's task was to embody the logical design of a Turing machine in a network of relay-operated switches ..." (Hodges p. 138). While Turing might have been just initially curious and experimenting, quite-earnest work in the same direction was going in Germany (Konrad Zuse (1938)), and in the United States (Howard Aiken) and George Stibitz (1937); the fruits of their labors were used by the Axis and Allied military in World War II (cf Hodges p. 298–299). In the early to mid-1950s Hao Wang and Marvin Minsky reduced the Turing machine to a simpler form (a precursor to the Post-Turing machine of Martin Davis); simultaneously European researchers were reducing the new-fangled electronic computer to a computer-like theoretical object equivalent to what was now being called a "Turing machine". In the late 1950s and early 1960s, the coincidentally parallel developments of Melzak and Lambek (1961), Minsky (1961), and Shepherdson and Sturgis (1961) carried the European work further and reduced the Turing machine to a more friendly, computer-like abstract model called the counter machine; Elgot and Robinson (1964), Hartmanis (1971), Cook and Reckhow (1973) carried this work even further with the register machine and random access machine models—but basically all are just multi-tape Turing machines with an arithmetic-like instruction set. the random access machine (RAM) as introduced by Cook and Reckhow ..., which models the idealized Von Neumann style computer. Only in the related area of analysis of algorithms this role is taken over by the RAM model. Algorithm, for a brief history of some of the inventions and the mathematics leading to Turing's definition of what he called his "a-machine"
↑ Minsky 1967:107 "In his 1936 paper, A. M. Turing defined the class of abstract machines that now bear his name. A Turing machine is a finite-state machine associated with a special kind of environment -- its tape -- in which it can store (and later recover) sequences of symbols", also Stone 1972:8 where the word "machine" is in quotation marks. ↑ Stone 1972:8 states "This "machine" is an abstract mathematical model", also cf Sipser 2006:137ff that describes the "Turing machine model". Rogers 1987 (1967):13 refers to "Turing's characterization", Boolos Burgess and Jeffrey 2002:25 refers to a "specific kind of idealized machine". ↑ Sipser 2006:137 "A Turing machine can do everything that a real computer can do". ↑ cf Sipser 2002:137. Also Rogers 1987 (1967):13 describes "a paper tape of infinite length in both directions". Minsky 1967:118 states "The tape is regarded as infinite in both directions". Boolos Burgess and Jeffrey 2002:25 include the possibility of "there is someone stationed at each end to add extra blank squares as needed". ↑ cf Rogers 1987 (1967):13. Other authors use the word "square" e.g. Boolos Burgess Jeffrey 2002:35, Minsky 1967:117, Penrose 1989:37. ↑ This table represents an algorithm or "effective computational procedure" which is necessarily finite; see Penrose 1989:30ff, Stone 1972:3ff. ↑ Boolos Burgess Jeffry 2002:25 illustrate the machine as moving along the tape. Penrose 1989:36-37 describes himself as "uncomfortable" with an infinite tape observing that it "might be hard to shift! "; he "prefer[s] to think of the tape as representing some external environment through which our finite device can move" and after observing that the " 'movement' is a convenient way of picturing things" and then suggests that "the device receives all its input from this environment. ↑ "Also by convention one of the states is distinguished as the stopping state and is given the name HALT" (Stone 1972:9). Turing's original description did not include a HALT instruction but he did allow for a "circular" condition, a "configuration from which there is no possible move" (see Turing 1936 in The Undecidable 1967:119); this notion was added in the 1950s; see more at Halting problem. ↑ The idea came to him in mid-1935 (perhaps, see more in the History section) after a question posed by M. H. A. Newman in his lectures: "Was there a definite method, or as Newman put it, a mechanical process which could be applied to a mathematical statement, and which would come up with the answer as to whether it was provable" (Hodges 1983:93). Turing submitted his paper on 31 May 1936 to the London Mathematical Society for its Proceedings (cf Hodges 1983:112), but it was published in early 1937 and offprints were available in February 1937 (cf Hodges 1983:129). ↑ See footnote in Davis 2000:151. ↑ Turing 1936 in The Undecidable 1965:132-134; Turing's definition of "circular" is found on page 119. ↑ Sipser 2006:137 observes that "A Turing machine can do everything that a real computer can do. Nevertheless, even a Turing machine cannot solve certain problems. In a very real sense, these problems are beyond the theoretical limits of computation." ↑ A.M. Turing (1948). "Intelligent Machinery (manuscript)". The Turing Archive. p. 3. ↑ Usually quintuples [5-tuples]: qiaj→qi1aj1dk, but sometimes quadruples [4-tuples]. Martin Davis (ed.) (1965), The Undecidable, Raven Press, Hewlett, NY. Emil Post (1936), "Finite Combinatory Processes—Formulation 1", Journal of Symbolic Logic, 1, 103–105, 1936. Reprinted in The Undecidable pp. 289ff. Emil Post (1947), "Recursive Unsolvability of a Problem of Thue", Journal of Symbolic Logic, vol. 12, pp. 1–11. Reprinted in The Undecidable pp. 293ff. In the Appendix of this paper Post comments on and gives corrections to Turing's paper of 1936–1937. In particular see the footnotes 11 with corrections to the universal computing machine coding and footnote 14 with comments on Turing's first and second proofs. Turing, A.M. (1936). "On Computable Numbers, with an Application to the Entscheidungs problem". Proceedings of the London Mathematical Society. 2 (published 1937). 42: 230–265. doi:10.1112/plms/s2-42.1.230. (and Turing, A.M. (1938). "On Computable Numbers, with an Application to the Entscheidungsproblem: A correction". Proceedings of the London Mathematical Society. 2 (published 1937). 43 (6): 544–6. doi:10.1112/plms/s2-43.6.544. ). Reprinted in many collections, e.g. in The Undecidable pp. 115–154; available on the web in many places. Alan Turing, 1948, "Intelligent Machinery." Reprinted in "Cybernetics: Key Papers." Ed. C.R. Evans and A.D.J. Robertson. Baltimore: University Park Press, 1968. p. 31. Reprinted in Turing, A. M. (1996). "Intelligent Machinery, A Heretical Theory". Philosophia Mathematica. 4 (3): 256. doi:10.1093/philmat/4.3.256. F. C. Hennie and R. E. Stearns. Two-tape simulation of multitape Turing machines. JACM, 13(4):533–546, 1966. Boolos, George; Richard Jeffrey (1999) . Computability and Logic (3rd ed.). Cambridge UK: Cambridge University Press. ISBN 0-521-20402-X. Boolos, George; John Burgess; Richard Jeffrey (2002). Computability and Logic (4th ed.). Cambridge UK: Cambridge University Press. ISBN 0-521-00758-5. Some parts have been significantly rewritten by Burgess. Presentation of Turing machines in context of Lambek "abacus machines" (cf Register machine) and recursive functions, showing their equivalence. Taylor L. Booth (1967), Sequential Machines and Automata Theory, John Wiley and Sons, Inc., New York. Graduate level engineering text; ranges over a wide variety of topics, Chapter IX Turing Machines includes some recursion theory. Martin Davis (1958). Computability and Unsolvability. McGraw-Hill Book Company, Inc, New York. . On pages 12–20 he gives examples of 5-tuple tables for Addition, The Successor Function, Subtraction (x ≥ y), Proper Subtraction (0 if x < y), The Identity Function and various identity functions, and Multiplication. Davis, Martin; Ron Sigal; Elaine J. Weyuker (1994). Computability, Complexity, and Languages and Logic: Fundamentals of Theoretical Computer Science (2nd ed.). San Diego: Academic Press, Harcourt, Brace & Company. ISBN 0-12-206382-1. Hennie, Fredrick (1977). Introduction to Computability. Addison–Wesley, Reading, Mass. QA248.5H4 1977. . On pages 90–103 Hennie discusses the UTM with examples and flow-charts, but no actual 'code'. John Hopcroft and Jeffrey Ullman, (1979). Introduction to Automata Theory, Languages, and Computation (1st ed.). Addison–Wesley, Reading Mass. ISBN 0-201-02988-X. A difficult book. Centered around the issues of machine-interpretation of "languages", NP-completeness, etc. Hopcroft, John E.; Rajeev Motwani; Jeffrey D. Ullman (2001). Introduction to Automata Theory, Languages, and Computation (2nd ed.). Reading Mass: Addison–Wesley. ISBN 0-201-44124-1. Distinctly different and less intimidating than the first edition. Stephen Kleene (1952), Introduction to Metamathematics, North–Holland Publishing Company, Amsterdam Netherlands, 10th impression (with corrections of 6th reprint 1971). Graduate level text; most of Chapter XIII Computable functions is on Turing machine proofs of computability of recursive functions, etc. Knuth, Donald E. (1973). Volume 1/Fundamental Algorithms: The Art of computer Programming (2nd ed.). Reading, Mass. : Addison–Wesley Publishing Company. . With reference to the role of Turing machines in the development of computation (both hardware and software) see 1.4.5 History and Bibliography pp. 225ff and 2.6 History and Bibliographypp. 456ff. Marvin Minsky, Computation: Finite and Infinite Machines, Prentice–Hall, Inc., N.J., 1967. See Chapter 8, Section 8.2 "Unsolvability of the Halting Problem." Excellent, i.e. relatively readable, sometimes funny. Christos Papadimitriou (1993). Computational Complexity (1st ed.). Addison Wesley. ISBN 0-201-53082-1. Chapter 2: Turing machines, pp. 19–56. Michael Sipser (1997). Introduction to the Theory of Computation. PWS Publishing. ISBN 0-534-94728-X. Chapter 3: The Church–Turing Thesis, pp. 125–149. Stone, Harold S. (1972). Introduction to Computer Organization and Data Structures (1st ed.). New York: McGraw–Hill Book Company. ISBN 0-07-061726-0. Peter van Emde Boas 1990, Machine Models and Simulations, pp. 3–66, in Jan van Leeuwen, ed., Handbook of Theoretical Computer Science, Volume A: Algorithms and Complexity, The MIT Press/Elsevier, [place? ], ISBN 0-444-88071-2 (Volume A). QA76.H279 1990. Valuable survey, with 141 references. Nachum Dershowitz; Yuri Gurevich (September 2008). "A natural axiomatization of computability and proof of Church's Thesis" (PDF). Bulletin of Symbolic Logic. 14 (3). Retrieved 2008-10-15. Roger Penrose (1990) . The Emperor's New Mind (2nd ed.). Oxford University Press, New York. ISBN 0-19-851973-7. Brunfiel, Geoff, Student snags maths prize, Nature, October 24. 2007. Jim Giles (2007), Simplest 'universal computer' wins student $25,000, New Scientist, October 24, 2007. Alex Smith, Universality of Wolfram’s 2, 3 Turing Machine, Submission for the Wolfram 2, 3 Turing Machine Research Prize. Vaughan Pratt, 2007, "Simple Turing machines, Universality, Encodings, etc. ", FOM email list. October 29, 2007. Martin Davis, 2007, "Smallest universal machine", and Definition of universal Turing machine FOM email list. October 26–27, 2007. Alasdair Urquhart, 2007 "Smallest universal machine", FOM email list. October 26, 2007. Hector Zenil (Wolfram Research), 2007 "smallest universal machine", FOM email list. October 29, 2007. Todd Rowland, 2007, "Confusion on FOM", Wolfram Science message board, October 30, 2007. Olivier and Marc RAYNAUD, 2014, A programmable prototype to achieve Turing machines" LIMOS Laboratory of Blaise Pascal University (Clermont-Ferrand in France). Martin Davis (2000). Engines of Logic: Mathematicians and the origin of the Computer (1st ed.). W. W. Norton & Company, New York. ISBN 0-393-32229-7. Robin Gandy, "The Confluence of Ideas in 1936", pp. 51–102 in Rolf Herken, see below. Stephen Hawking (editor), 2005, God Created the Integers: The Mathematical Breakthroughs that Changed History, Running Press, Philadelphia, ISBN 978-0-7624-1922-7. Includes Turing's 1936–1937 paper, with brief commentary and biography of Turing as written by Hawking. Rolf Herken (1995). The Universal Turing Machine—A Half-Century Survey. Springer Verlag. ISBN 3-211-82637-8. Ivars Peterson (1988). The Mathematical Tourist: Snapshots of Modern Mathematics (1st ed.). W. H. Freeman and Company, New York. ISBN 0-7167-2064-7. Roger Penrose, The Emporer's New Mind: Concerning Computers, Minds, and the Laws of Physics, Oxford University Press, Oxford and New York, 1989 (1990 corrections), ISBN 0-19-851973-7. Paul Strathern (1997). Turing and the Computer—The Big Idea. Anchor Books/Doubleday. ISBN 0-385-49243-X. Hao Wang, "A variant to Turing's theory of computing machines", Journal of the Association for Computing Machinery (JACM) 4, 63–92 (1957). Arora, Sanjeev; Barak, Boaz, "Complexity Theory: A Modern Approach", Cambridge University Press, 2009, ISBN 978-0-521-42426-4, section 1.4, "Machines as strings and the universal Turing machine" and 1.7, "Proof of theorem 1.9"
Kantorovitz, Isaiah Pinchas (December 1, 2005). "A note on turing machine computability of rule driven systems". SIGACT News. ACM. 36 (4): 109–110. doi:10.1145/1107523.1107525. Retrieved April 6, 2014. Wikimedia Commons has media related to Turing machines. Turing Machine-Like Models in Molecular Biology, to understand life mechanisms with a DNA-tape processor. The Wolfram 2,3 Turing Machine Research Prize—Stephen Wolfram's $25,000 prize for the proof or disproof of the universality of the potentially smallest universal Turing Machine. The contest has ended, with the proof affirming the machine's universality. "Turing Machine Causal Networks" by Enrique Zeleny, Wolfram Demonstrations Project.